Health - Digital Marketing Consultant, Author & Speaker – Mark Attwood. Health - Digital Marketing Consultant, Author & Speaker – Mark Attwood. I have to start this review of these amazing shoes with a word or two about grounding. We humans have been suffering for over a century from not grounding with the Earth enough. I guess it’s something to do with all the plastic footwear we all wear. I know myself that I have suffered from static shocks for years, and that whenever I wear certain trainers or walking shoes, all made of plastic, I could feel the charge building up in my legs. Maybe it’s because of my sheer magnetism, or maybe it’s because, like all humans, I’m an electrical construct. The point is, I really hated this static build up to the point where I’d nevervously close my car door after getting out because I knew there’d be a big spark. It’s not that it hurt so much, but they were uncomfortable and stressful. What I learned from the film, which is really a RE-discovery about the incredible healing effects of being ground, and connected to the Earth, led me to regularly walking barefoot, especially in wet grass – the feeling was just wonderful, and I noticed the health effects right away. In fact, I’d end up going on about grounding at my internet marketing seminars because the effects of it were so profound for my life. 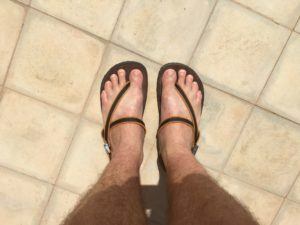 So, because I live in Morocco where it’s regularly been over 45 degrees Celsius throughout the summer, my mind went back to finding a grounding solution because I was spending a lot of time in plastic flip-flops which, although cool, were doing me no good at all. “Earth Runners are grounded minimalist sandals inspired by the world renowned long distance runners,world renowned long distance runners, the Tarahumara Native American Indians of Northwestern Mexico. Our custom molded sandals recreate that one-of-a-kind primal experience of running or hiking barefoot, while minimizing risk of injury to your feet. Earth Runners give you that satisfying “ground feel,” while offering both protection and comfort in a great fitting sandal. What distinguishes Earth Runners from other minimalist sandals is our original design that allows you to absorb the ever-present subtle electrical energies of the earth: this provides an experience similar to going barefoot, while still enjoying a measure of safety from varied terrains or street hazards. Now, I had a problem in Morocco – whenever I’ve tried to get a parcel delivered here from overseas, they always get trapped in customs in Casablanca who then charge you a ridiculous sum of money to release them plus you have to waste a whole day making the 5 hour drive there from Marrakech. I learned this early on in my adventure here, so I was not going to take that risk. So I went ahead and purchased them and got them sent to my wife’s parents in Ireland, because we were due to visit there in the summer. But, as often happens with the best laid plans, that visit did not occur, but finally after 5000 miles and two months I got my Earth Runners at the weekend and my God, are they good! Not only do they feel fantastically comfortable, it’s almost like there is no shoe there. The electrical swelling in my legs has gone and this morning I involuntarily sprinted upstairs to my office. At the top of the stairs I was like “wow, where did that come from?”, especially as I had been feeling more physically sluggish than usual throughout the entire summer in the heat. I can literally feel the grounding and the increase in energy. I might even take the plunge and start running in these things (well, that’s what they’re really designed for). Seriously – the idea of grounded shoes is going to take off. It’s totally logical, and once more people like me rave about the health benefits, the more people are going to demand them. I am very grateful to Mike Dally, the genius behind Earth Runners, for making a truly excellent product. Thank you!